Eye makeup is one of the best and funnest ways for you to transform your entire facial appearance. With so many fun makeup tutorials online, you can perfect just about any eye makeup look with just a little bit of practice. One of the things that we encourage all of our patients to do here at Papale Eye Center is to thoroughly wash their eye makeup brushes every month. How Can I Clean My Eye Makeup Brushes? Whether you have synthetic or real hair makeup brushes, you can usually wash them with warm water and antibacterial soap. To do this, start by placing the tip of your brush under warm water. Then, gently massage some antibacterial hand soap into the brush and massage it. You should start to notice a lot of makeup and residue coming out (which is what you want to see). Continue doing this until you notice that the water is running clear and all of the eye makeup is out o fit. You may think aht cleaning your foundation brush or your blush brush is the most important, but here at our office we may beg to differ. Because you are getting your makeup brushes so close to your eyes everyday, you are putting your eyes at risk of makeup falling into them or bacteria getting in them. By cleaning your eye makeup brushes on a regular basis, however you can prevent these things from happening which will leave you with less of a chance of an infection and more time to pracie more of the eye makeup tutorials that you love. 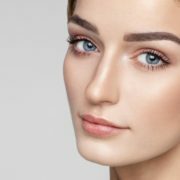 To make sure that you get precise lines during every makeover while also avoiding an eye infection, make sure that you use the tips listed in this article. To learn more, contact us at our Springfield office and call us at (413) 782-0030. Getting your mother’s good looks and your dad’s wit is something to definitely be proud of, but getting stuck with some genetic eye conditions is something that nobody wants. 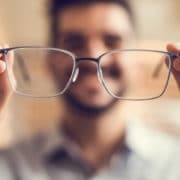 Here at Papale Eye Center, we see patients for a variety of different reasons including some of the genetic conditions listed in this article. More than 60 percent of eye conditions in infants that cause blindness are genetic and include conditions such as congenital cataracts, retinal degeneration, optic atrophy, congenital glaucoma, and eye malformations. Lazy eye or strabismus is a condition where one of your eyes goes the other way and usually presents itself in young children; this is another condition that is linked to genetics but can easily be treated with non-invasive procedures like wearing an eye patch or glasses. The two leading causes of blindness in adults are glaucoma and macular degeneration. Although these two diseases can be caused by a variety of things, one of the biggest links is genetics. With both of these conditions, if you catch them early on, they can usually be treated and you can stop them from getting worse. If you have a family history of any of these diseases, make sure to tell us in your next eye exam. The more we know about your medical history and your family’s medical history, the easier it will be for us to keep an eye out for these diseases. Are you ready to schedule an eye exam at Papale Eye Center? If so, contact our Springfield office today and call us at 413) 782-0030. One of the quickest ways for contact lens wearers to get an eye infection is to not take proper care of them. If you wear contact lenses every day, we have a few tips to help you keep them cleaner and your eyes rid of an eye infection. Let’s take a closer look at how. Before you even pick up your contact lens to put them in or before you go to take them out, make sure that you wash your hands with warm water and soap. Dirty hands are one of the fastest ways to spread bacteria to your eye and cause an eye infection or problem. 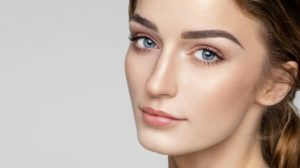 Contact cleaning solution isn’t just some sort of marketing scheme to try to get you to buy more things for your eyes; in fact, contact cleaning solution is one of the best ways for you to ensure that your contacts and eyes stay as clean as possible. Before you put your contacts in their case at night and before you put them in in the morning, squirt a little bit of contact solution directly onto your contacts; this will help get off any dirt, germs, or bacteria. You may not realize it, but that small contact lens case that you have on your counter may be harboring more germs and bacteria than you know of. 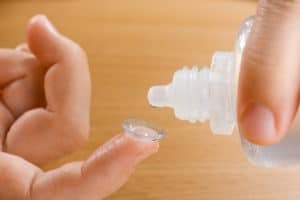 Try getting in the habit of washing out your contact lens case every couple of days with some hot water. If you wear dailies, then you know that you can put them in the trash can every night, but when it comes to regular disposable contact lenses, about every 1-3 months on average. Depending on the type of contact lenses you get, we will tell you how often to switch them out. 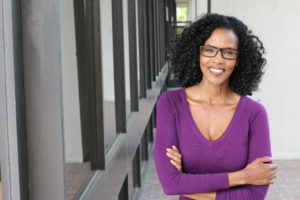 Taking good care of your eye health starts with doing simple things like getting regular eye exams and taking good care of your contact lenses. If you want to learn more about your vision health, schedule a consultation with us at our Papale Eye Center Springfield office and call us at (413) 782-0030. You are what you eat, right? Yes, it’s true that if you eat a diet high in bad fats and high in cholesterol (like that burger you at last weekend, oops!) then you are at a higher risk of being overweight. But when it comes to other parts of your health— like your vision— how much of an impact does your diet have? Let’s take a closer look. 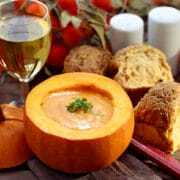 In an article published by The American Journal of Clinical Nutrition last summer, it said that a diet high in starchy and sugary foods could increase your chances of getting macular degeneration— an eye disease that can cause vision loss or impairment. In the study, it said that the frequent spike in blood sugar is what had the most influence on the development of macular degeneration. The same study also indicated that people who ate a healthy diet that was s rich in antioxidants were less likely to get macular degeneration. Your eyes are exposed to a variety of different environmental factors each day which can contribute to a variety of different eye diseases and problems. 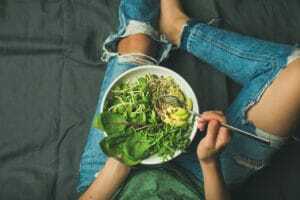 Studies show that people who eat a diet rich in fruits and vegetables— especially leafy greens— that contain nutrients like zeaxanthin have more protection against oxidative changes to the retina. 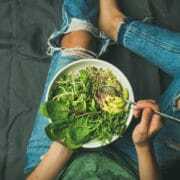 If you aren’t already eating enough leafy greens, try adding a spinach salad to your dinner plate every night or try making a green smoothie for breakfast each morning. As previously mentioned, antioxidants are good at protecting your eyes against macular degeneration, but did you know that they are also good at healing your eyes as well? Plus, antioxidants may be in some of your favorite foods like dark chocolate, berries, and even some nuts! To learn more about how you can take better care of your vision or to schedule an appointment, contact our Papale Eye Center office at 413.782-0030. Make 2018 your healthiest year yet by making some resolutions that will have a big impact on your ability to see better. By making these three resolutions, you can have a clearer vision and keep your eyes protected all year long. If you don’t’ know your family’s medical history— make 2018 your year of getting to know a little bit more about your family’s vision history. For instance, several types of glaucoma are hereditary, so if you find out that your parents or other relatives have or had glaucoma, then this gives you more of a reason to get checked for glaucoma by Papale Eye Center on a regular basis. 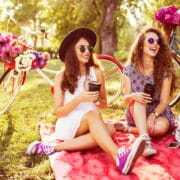 You may think that sunglasses are just a way for the rich and famous to shield their eyes from all of the flashing lights from paparazzi, but they’re one of the best ways for you to protect your eyes from sun damage. Make sure to buy sunglasses that have both UVA and UVB protection to ensure that your eyes are shielded. 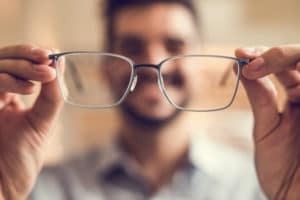 If you have been struggling with wearing your contact lenses and glasses for years on end, then make 2018 your year to get Lasik eye surgery from Papale Eye Center. Depending on the type of vision that you need to be corrected, Lasik may be the best solution for you. During your initial Lasik consultation at our office, we will perform an eye exam to help you decide what corrective surgery is ideal for you. Ready to learn more about how you can have better vision in 2018? 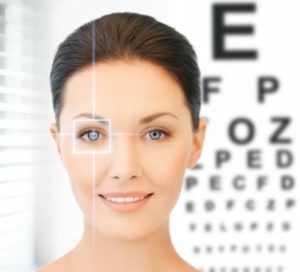 Schedule your vision appointment at our Springfield office today! We’ve all been there— you’re walking down the street or having a conversation with someone when all of a sudden you get something in your eye. Not only can having dirt, dust, or an eyelash trapped in your eye be uncomfortable, but it can make it also make it nearly impossible to see. Although your initial reaction may be to rub your eye or reach into it with dirty fingers, these two methods can cause more damage than good. This article will discuss things to avoid when getting something out of your eye and how to flush it properly. Read on to learn more. Babies do it, kids do it, and yes, even adults are known to rub their eyes when they get tired. When you have something stuck in your eye, make sure that you don’t rub it. Not only could rubbing your eyes cause the dirt to scratch your cornea, but rubbing can also place a lot of undue pressure on your eyes which can blur your vision and cause permanent damage. Your first inclination to get something out of your eye will likely be to use your fingers. However, unless your hands are clean and you know exactly what you’re doing, this is one of the last things you should do. Dirty fingers can spread bacteria across your eyes, while the pressure from your fingers can scratch your cornea. If you don’t have anything else to get the dirt out of your eyes, you can use a clean finger, but it’s not recommended. The best method that we at Papale Eye Center encourage our patients to use to get something out of their eye is to flush it with warm, clean water. How do you do this exactly? Simply take an eyedropper and fill it with clean, lukewarm water. With a clean hand, hold your infected eye open and use the other hand to gently squeeze the water into your eye. The water will work the object out of your eye without scratching it in the process. Having something trapped in your eye can be beyond obnoxious. And although you’ll want to act fast to get it out, it’s important that you do it the right way. To learn more about eye health and care, contact the doctors at Papale Eye Center today!